Realistic Seller Who wants "Axis" Gone NOW!! If a Tayana 48 is in your future we need to talk NOW. Owner Anxious ! A FRESH START FOR "AXIS"
Seller orders a complete re-fit package for his already exceptional SHOAL DRAFT (5'3") Tayana 48! WHAT A PACKAGE! WHAT AN OPPORTUNITY!! 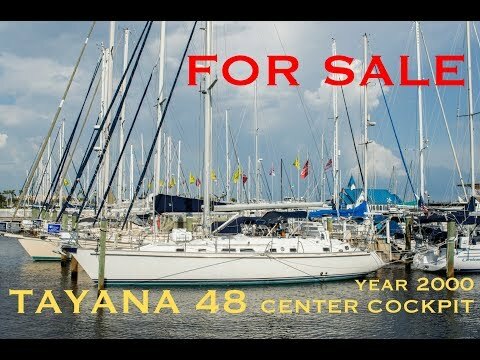 This is your chance to own a timeless shoal draft Tayana 48' Center Cockpit Cutter that has not been "Buggered Up" by past Owner's electrical, mechanical or personal considerations. We welcome your most rigid inspection! PLEASE SEE FULL SPECS FOR A VIDEO LINK TO VIEW "AXIS"
*If interested in a BEAUTIFUL marina in which to keep this exceptional Tayana 48 the Seller has a 60 foot slip FOR SALE at Longboat Key Moorings Marina in Longboat Key, Florida. Please inquire for further information. More Info : CLICK FOR VIDEO OF "AXIS"
Master Stateroom: Spacious aft stateroom with a centerline queen berth that is surrounded by beautiful teak cabinetry, drawers, hanging lockers and a bookcase wall. The ensuite head is to starboard with sink and vanity, four drawer bureau, Raritan head, and shower stall with door enclosure. Galley: Located portside in the walk-thru between the master stateroom and salon. Amidships, below and behind the companionway is an island with expansive counterspace and the 70/30 sink. The microwave is located in cabinetry above the sink. Below this counter is the engine and genset compartment with access hatches beneath. Hullside are storage lockers, drawers, stove, refrig and freezer. Salon: Accessed from the cockpit by a companionway with magnificent teak steps. Storage in the salon is above, behind and under the settees. A u-shaped settee to port surrounds the exquisite teak dining table with integral wine locker. To starboard is a settee with teak lockers over and a beautiful teak cocktail table in front of. Nav Station: Aft of the starboard settee is the spacious uncomparable nav station that houses the electronics, AC/DC electrical panels and instrumentation. It is lazy L-shaped with an angled corner, 3 flip-top compartments, a swivel seat and plenty of cabinet storage beneath. This nav station will please the most discerning Captain or Navigator. Workshop! - Forward to port. A true "Man Cave" with workbench, vise, fiddled shelving, tool compartments, storage drawers, overhead lockers, 5 workbench lockers, 4 drawers, 2 opening ports and an overhead hatch. Best of all it is privacy doored so you won't get yelled at! Guest head: Starboard side with full size commode, sink and vanity, ample teak cabinetry, medicine cabinet w/ mirror, separate stall shower with door enclosure, teak shower seat and teak shower grate. 7 door engine room access! SIMPLY PUT. Her current electronics upgrade and running rigging replacement package make her the best Tayana 48 on the market. We gladly cooperate with all Florida Licensed brokers on a 50/50 basis. Brokers not licensed in Florida contact us for further details.